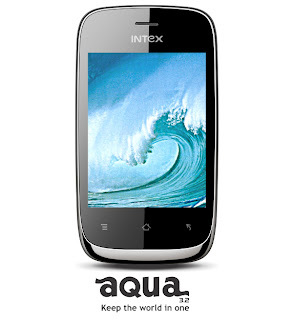 The Indian Mobile Phone Maker, INTEX launches a new budget Android 2.3.5 Gingerbread Smartphone -- The Intex Aqua 3.2. The smartphone is priced at a reasonable cost of Rs. 3,790. The Aqua 3.2 sports a 3.2 inch-ed Capacitive Touch Screen with a resolution of 240 x 320 pixels. It measures 110.5 x 61 x 12.6 mm in dimension and weighs around 125 grams. The Intex Aqua 3.2 is powered by a 1GHz processor bundled up with 512MB of RAM and as, mentioned above, it features Android 2.3.5 Gingerbread version OS. It also offers dual-SIM support (GSM+GSM). It has a 2 MP Camera on its back. Other specifications of the Intex Aqua 3.2 include GPRS/WAP/EDGE connectivity, Bluetooth v2.0 with A2DP, FM radio, expandable storage up to 32GB via microSD, a G-sensor, and a 1,200 mAh battery rated to deliver up to 3 hours of talktime, and 180 hours of standby time. Intex has also pre-loaded the Aqua 3.2 with a variety of apps and games, such as Fruit Ninja, Nimbuzz, Gmail, YouTube, IRCTC, and more. It also features access to the Google Play store. The Intex Aqua 3.2 also supports both English and Hindi languages, and also comes with features push mail, mobile tracker, audio call record, and caller group. The Intex Aqua 3.2 will be available in silver, blue and black colours, and can be bought from 15,000 plus distributors and reseller outlets across the country, or at Intex Squares. Also, the company is offering the smartphone with a free backpack worth Rs 700 as an introductory offer. Sanjay Kumar, general manager, mobile business, Intex said, "We are convinced that Intex Aqua 3.2 will play an important role in bringing high performance touch enabled smartphone to the true mass market while contributing substantially to the market share of our mobile business." 0 Respones to "INTEX launches the AQUA 3.2, Costs Rs.3,790"